FILE - Samantha Power, the U.S. ambassador to the United Nations, says Russia's call for a review of an apparently errent U.S. bombing in Syria was a "stunt" designed to divert public attention from Syrian government atrocities. The U.S. ambassador to the United Nations blasted Russia for calling the U.N. Security Council into emergency session late Saturday to review an apparently errant U.S. bombing run that may have killed dozens of Syrian government troops. Samantha Power, speaking to reporters on her way into the closed-door session, said Russia's action was "a stunt replete with moralism and grandstanding," designed to divert public attention from some of the "most systematic atrocities in a generation." Power said the U.S. government was still gathering facts about the bombing, which some reports said might have killed as many as 80 troops in Deir Ezzor. She said U.S. coalition warplanes thought they were targeting Islamic State extremists, and that it "was not our intention" to violate a cease-fire by hitting Syrian government fighters. “If we determine we did indeed strike Syrian military personnel, that was not our intention, and, we of course, regret the loss of life,” she said. But Power then cited repeated incidents of Syrian government atrocities — airstrikes against hospitals and schools, cordons around cities that caused starvation, and use of chemical weapons against civilian targets. 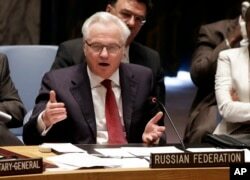 In all those cases, the U.S. envoy said, Moscow never called for Security Council action. "Imagine how often the council would be meeting if we were to call an emergency meeting each time Russia or Syria bombed a hospital" in the war-ravaged country, Power said. "Russia never calls for Security Council consultations about these practices." FILE - Vitaly Churkin, Russia's ambassador to the U.N., said the timing of the U.S. strike was suspicious, coming as the two countries were trying to forge a lasting cease-fire deal, and questioned whether it was truly a mistake. Russia's U.N. ambassador, Vitaly Churkin, said Power's angry words were "demagoguery of the highest order." Churkin said timing of the U.S. strike was suspicious, coming as the two countries were attempting to forge a lasting cease-fire deal, and questioned whether it was truly a mistake. “It may well be, one has to conclude, that the airstrike has been conducted in order to disrupt the operation of the Joint Implementation Group and to actually not allow it to be set in motion,” Churkin said. The Russian envoy said the United States was losing control of the moderate Syrian militant factions it backs, and he contended this had empowered extremists like IS and Jabhat Fateh al-Sham (formerly known as the al-Nusra Front). He went on to question who is in charge in Washington. “Is it the White House or Pentagon? Because we have heard statements from the Pentagon which simply fly in face of what we have heard from President [Barack] Obama and Secretary of State John] Kerry,” he said. Both ambassadors stopped short of saying that Saturday's airstrike meant the cease-fire deal had collapsed. “The United States is extremely serious about making this agreement work,” Power said, but she urged Moscow to deliver on its obligations to get the regime of Syrian President Bashar al-Assad to stop bombing moderate opposition groups that are party to the cessation of hostilities. Security Council members gathered several hours after the reports that U.S. warplanes had struck the Syrian forces near the Deir Ezzor airport. A U.S. statement said coalition commanders had informed Russian authorities about the planned strike in advance. For its part, Russia's Defense Ministry described the coalition strike as evidence of Washington's "stubborn refusal" to coordinate its actions with Russian forces fighting alongside government forces loyal to Assad. The truce, aimed at halting military operations by Syrian forces, their Russian allies and U.S.-backed rebels seeking to oust the Assad government, was designed to clear the way for humanitarian aid to besieged areas of the country. Hundreds of thousands of civilians in those areas have been cut off from outside aid for months and are facing critical shortages of food and medicine. Activists in Syria’s besieged Aleppo rally against the United Nations for what they say is its failure to lift the siege of their rebel-held area, Sept. 13, 2016. Russian President Vladimir Putin said his country was holding up its end of the cease-fire agreement, but he cast doubt on the United States' commitment to the deal, saying Washington was deviating from its own call for openness. "I don't really understand why we have to keep such an agreement closed," Putin said in a televised appearance on a trip to Kyrgyzstan. He also said Moscow would not unilaterally release the terms of the deal. The Russian leader further criticized U.S. officials for their inability to separate the so-called healthy part of the opposition from what he called "the half-criminal and terrorist elements." "This is a very dangerous route," he said. Under the cease-fire agreement announced by Kerry and his Russian counterpart, Sergei Lavrov, in Geneva a week ago, hostilities should have paused Monday, when the Muslim world marked the beginning of the Eid al-Adha holiday. U.S. and Russian military leaders were then set to coordinate airstrikes against IS fighters and those of Jabhat Fateh al-Sham, which are not parties to the truce. Officials in Washington and Moscow on Friday expressed a desire to extend the cease-fire pact and confirmed aid deliveries had not yet begun. But they agreed on little else concerning the tenuous situation in Syria. The White House indicated Friday that the next phase of the deal would not move forward until the aid was moving freely. Children are seen playing near the rubble of damaged buildings in the rebel-held Bab al-Hadid neighborhood of Aleppo, Syria, Sept. 14, 2016. Ahead of the coalition airstrikes at Deir Ezzor, the Britain-based Syrian Observatory for Human Rights said intermittent shelling and clashes had resumed overnight on several fronts in Syria. In particular, fighting erupted between rebels and pro-government forces in the opposition-held suburb of Eastern Ghouta, near Damascus, and airstrikes hit several towns in the central province of Homs. Forty trucks carrying desperately needed relief for the divided city of Aleppo waited Friday at a checkpoint at the Turkish border, and the U.S. blamed the Syrian government for the holdup. "Those trucks should be going in and that aid should be getting delivered with or without the arrangement that was arrived at in Geneva," State Department spokesman John Kirby said. "It is the [Syrian] regime that is blocking the movement." U.N. relief officials said conditions were not yet safe for the vehicles to cross into Syria. But Churkin said an aid convoy was expected to head to eastern Aleppo Sunday morning. Steve Herman contributed to this report from the State Department; Jamie Dettmer contributed from Gaziantep, Turkey; Margaret Besheer contributed to this report from the United Nations.